So, your daughter wants to lose weight. That’s far from rare – more and more young people are becoming aware of their bodies and wish to lose weight. It’s usually much harder for teenagers to lose weight, especially on their own. When they try to lose weight on their own, they tend to skip meals, crash diet, calorie restrict, over exercise, and more. Unsupervised weight loss for teenagers can be dangerous, and more often than not it can lead to eating disorders. 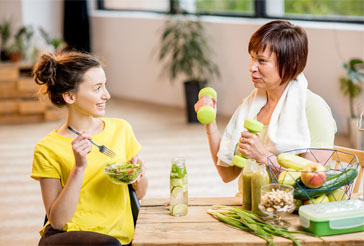 As a parent, it is important for you to encourage healthy eating habits to help your teenager lose weight. What does a 16-year old’s diet need? 16-year-old females should be eating anywhere from 1750-2350 calories a day, depending on their activity level. The more active they are, the more calories they will need to eat. Calorie restriction is never healthy for a growing teenager. Especially while in school, they will not be able to focus properly, and it can negatively affect their growth and development. Teenagers need a diet that is high in fiber, calcium, protein, iron, and healthy fats. They also need various vitamins such as Vitamins A, C, and B vitamins. Breakfast is a vital part of the day for everyone, especially teenagers. Skipping breakfast actually prevents weight loss, because it can make a teenager’s body go into starvation mode. Starvation mode is where your body holds onto calories instead of burning them because it is unsure of when the next time it will receive food. Eating breakfast consistently lets the body know that it can depend on you to nourish it every morning. Protein packed breakfasts are always great for energy and weight loss. A good breakfast would be around 500 calories. A bowl of oatmeal with fruits, nut butter, and seeds is filling and nutritious. A smoothie is also a quick and easy breakfast that your teenager can take to school with them when they’re in a rush. Pack it full of fruit (frozen or fresh), chia or flax seeds, fresh greens such as spinach, and protein powder if they want. You could even add ingredients such as Greek or coconut yogurt. Lunch is another important meal that shouldn’t be missed. Chances are your daughter will be eating lunch during school. It’s important to make sure that she has a nutritious lunch ranging from anywhere between 500-700 calories. 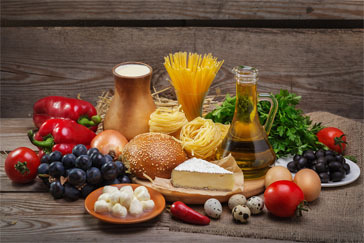 Some healthy lunch ideas are whole grain sandwiches with mustard, veggies, and other toppings of her choice, wraps, leftovers from dinner, veggies with hummus, boiled eggs, salads, and whatever other foods she enjoys to eat. Dinner is the last meal of the day, and it’s just as important as breakfast and lunch. Dinners should be hearty, and satisfying. They should range anywhere from 500-800 calories. 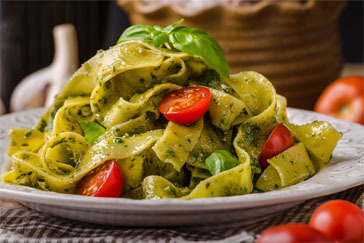 Some healthy dinner examples that you could make are chilis, corn chowder, pita pizzas, burritos, rice with stir-fries, baked potato wedges, lasagnas, lentil soups, grilled salmon with salads, casseroles, burrito bowls, chickpea patties, and much more. Find recipes online and recreate some of your daughter’s favorite foods, just make a healthier version. 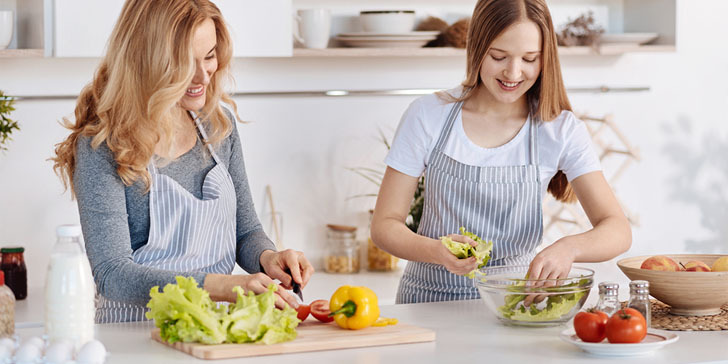 If your teenager enjoys cooking, try having a few nights a week where you make dinner together. Being a part of the cooking process is always fun and it’s a great way to keep her on track. One of the most important parts of losing weight is having healthy food around. If the house is full of healthy food, that is what your daughter will eat. Resist buying junk food, even if it is for yourself. That can be tempting to your daughter, and she needs the support of you eating healthy with her. Buy lots of fruits and vegetables, these are the best snacks to eat. Other great snacks are rice cakes, crackers, hummus, pretzels, applesauce, energy bars, nuts, and seeds. You can also make a batch of healthy homemade cookies and desserts for a treat sometimes. For example, you could make raw bliss balls in a food processor. Use ingredients such as dates, oats, and peanut butter for a delicious, simple, and healthy snack. Exercise is still an important part of weight loss, but there shouldn’t be a huge focus on it. If your daughter lives close to school, a good exercise could be walking or biking to and from school. Joining a sports team at school such as rugby, soccer, or track running is a great form of exercise that she can do with friends. If she already has to do an hour of gym every day for a mandatory school class, that’s great for her and will speed up her weight loss. Finally structure is very important, so stay consistent with the new habits you help her form. Don’t skip breakfast she needs a healthy meal in the morning. Pack her a healthy lunch that satisfies and doesn’t lead to cravings. it’s not enough that we teach our children what to eat, it is very important that we do what we say so they’ll copy what they see. always stock up on healthy snacks and take those junk food away. eat healthy. this the most effective way of teaching your child. they copy what you do. it’s best that you stock up on healthy snacks so they won’t have a choice but to eat them as opposed to eating junk food just cause they’re too available in your pantry. i always prepare my kids’ lunch and snacks. now i will try to add more healthy picks from now on. if they have only the healthier foods available at home, they will get used to them and will not be tempted having junk foods. never skip breakfast and choose to eat healthy snacks in between. these will help a lot! as they say…prevention is better than cure. train your child early on so you won’t have to deal with this when they grow a bit older. i am definitely sharing these to all my mom friends! practice eating healthy and you teens will get the same habit. are 16-year olds supposed to be too conscious? indeed the best diet tips there is! never skip breakfast. it’s the most important meal of the day!